The next deadline for small grants ($10,000 and less) through the Minnesota Historical & Cultural Heritage Grants program will be Friday April 11, 2014. Contact the Grants Office if you have questions about your proposal. The publication "Red Earth White Road," about the Joseph LaFramboise Family, was printed and distributed to over 250 schools, libraries and historical organizations throughout the 19 counties of southwestern Minnesota. The publication was also added to the Historical Essays on Rural Life Series of the Society for the Study of Local and Regional History. To help launch the publication, author Janet Timmerman presented at Southwest Minnesota State University in collaboration with the travelling exhibit, "Commemorating Controversy: The Dakota-U.S. War of 1862." It's important to have well-respected community members on your boards and committees. Check out a new interactive tool called Mapping the African American Past (MAAP). Using it, the Tenement Museum in New York discovered a famous neighbor! Some thoughts on museum leadership. For Women's History Month: a move to give credit to female scientists. A museum's attempt to appeal to Generation Y.
Interpreting gender and sexuality at historic sites. Stearns History Museum, St. Cloud MN, seeks Patron Services Coordinator. Deadline: March 14, 2014, 5 p.m. The Historic New Orleans Collection, New Orleans LA, seeks Editor and Associate Editor. Deadline for both: March 21, 2014. Environmental Resources Management (ERM), Cleveland OH, seeks Architectural Historian Principal Investigator. Ohio Historical Society, Columbus OH, seeks Curator for the natural history collections. Chemical Heritage Foundation (CHF), Philadelphia PA, offers two 12-14 week paid internships in collections management during Spring/Summer 2014. Email cover letter, resume, and at least two professional references. Galveston Historical Foundation, Galveston TX, seeks collections intern. Email cover letter, resume, and three professional references. Deadline: April 14, 2014. Nicollet County Historical Society, St. Peter MN, invites the public to view "Queen of the Sun," the March selection for their documentary film series, Thursday March 6, 2014, 7 p.m. Call 507-934-2160 for more information. Germanic Genealogy Society will meet Saturday March 8, 2014, Minnesota Genealogical Society, South St. Paul, 8:30 a.m. to noon. Cost: $10. For more information visit the GGS website or call Kent, 612-920-8118. Landmark Center, St. Paul MN, hosts Skylark Opera, who will perform on Sunday March 9, 2014, 1 p.m. Free. Call 651-292-3225 for more information. Friends of LeDuc of Historic Hastings will meet on Tuesday March 11, 2014, 7 p.m. at the Estate. Following the business meeting will be a presentation on "Skis, Snowshoes, and Skates." Call 651-437-7055 for more information. Wright County Historical Society, Buffalo MN, announces their next Coffee Chat, Being a 4-H'er! with the Roaming Buffalo 4-H Club, Tuesday March 11, 2014, 6:30 p.m. Call 763-682-7323 for more information. Stearns History Museum, St. Cloud MN, invites the public to their March Breakfast Club, Wednesday March 12, 2014, 9 a.m. Leigh Lenzmeier will speak about his father E.C. "Ed" Lenzmeier, who was Stearn County Extension Agent and social entrepreneur from the early 1930s to the late 1960s. Call 320-253-8424 for more information. Landmark Center, St. Paul MN, announces the Irish Music & Dance Association's Irish Day of Dance and St. Patrick's Day Celebration, March 16-17, 2014. Ramsey County Library-Maplewood hosts Sara Markoe Hanson, Executive Director of the White Bear Lake Area Historical Society, who will speak on "Gangsters of Ramsey County: a Hair-Raising History," Tuesday March 18, 2014, 7 p.m. Call 651-724-6022 for more information. Join Wright County Historical Society, Buffalo MN, for a presentation by Ed Claessen on Caterpillar tractors, Tuesday March 18, 2014, 1:30 and 6:30 p.m. Call 763-682-7323 for more information. Ramsey County Library-White Bear Lake hosts Sara Markoe Hanson, Executive Director of the White Bear Lake Area Historical Society, who will speak on "Then & Now: Downtown White Bear--Part 2," Wednesday March 19, 2014, 2 p.m. Call 651-724-6022 for more information. Isanti County Historical Society, Cambridge MN, hosts musician Lauren Pelon, who will appear in a unique concert for Women's History Month, Thursday March 20, 2014, 6:30 p.m. Call 763-689-4229 for more information. Blue Earth County Historical Society, Mankato MN, will celebrate the county's banking and financial institutions at their annual fundraiser, "Surrounded by History: Banking in Blue Earth County," March 21, 2014, 6 p.m., Centennial Student Union Ballroom, Mankato. Tickets: $50/person; available through March 7, 2014. Call 507-345-5566 for more information. LeDuc Historic Estate, Hastings MN, announces that the Mill City String Trio will perform Sunday March 23, 2014, 3 p.m. Call 651-437-7055 for reservations. Wright County Historical Society, Buffalo MN, holds their fourth Book Club event Friday March 28, 2014, 1:30-3 p.m. Local authors Ed and Sue Claessen will speak about their book "Making Tracks: C.L. Best and the Caterpillar Tractor Co." Call 763-682-7323 to RSVP. Anoka County Historical Society, Anoka MN, announces their Annual Meeting, Sunday March 30, 2014, noon, Murzyn Hall, Columbia Heights MN. Author John Cox will speak on the Battle of Antietam. Cost: $15/ACHS members; $20/nonmembers. RSVP by March 25, 2014. Call 763-421-0600 for more information. Landmark Center, St. Paul MN, hosts "Uncle Sam Worked Here: Conversations in Public History," their Spring 2014 lecture series. Reservations required, 651-292-4375. Author Paul Maccabee and lawyer Tom Boyd discuss "Distilling Crime: Bootlegging, Corruption & the Minnesota Courts in the 1920s," Saturday March 8, 2014, 10:30 a.m. Professor Melanie Gabbert-Gatchell discusses "Andrew Volstead: The Private Man Behind the Public Face of Prohibition," Saturday April 5, 2014, 10:30 a.m.
Minnesota Council of Nonprofits hosts "Advanced Grantwriting: Taking your Grantsmanship to the Next Level," in two parts, March 27, 2014, 1-4:30 p.m. and April 23, 2014, 1-3:30 p.m., MCN Conference Room, St. Paul MN. Focusing on Visitors: Public Programming and Exhibits at History Institutions, April 3-4, 2014, Governor Langdon House, Historic New England, Portsmouth NH. Connecting Your Collections to Teachers and Students, April 10-11, 2014, Ohio Historical Society, Columbus OH. Minnesota Genealogical Society invites the public to "Genealogy TechTrek" featuring Thomas MacEntee, April 25-26, 2014, Hennepin Technical College, Brooklyn Park MN. Registration opens in early March. American Association for State and Local History announces that applications are now being accepted for the Developing History Leaders @ SHA program, which will take place October 25-November 14, 2014. Application deadline: May 19, 2014. The annual History Matters Day at the Capitol will take place on Monday March 10, 2014, 10 a.m. to 2 p.m. Come join your local history colleagues in the Capitol Rotunda and let your legislators know that History Matters! Dorothy Molter Museum, Ely MN, has named Jess Edberg as its new Visitor Services Manager. The AASLH Nomenclature Task Force has asked PastPerfect to reach out to users for feedback about Nomenclature 3.0. Submit your comments to Ron Kley. The latest issue of Common-Place is now available online. National Alliance of Preservation Commissions announces that the latest issue of The Alliance Review is now available online. Minnesota State Arts Board announces that the FY 2015 Folk and Traditional Arts grant program is now open for application. Deadline: Friday May 2, 2014, 4:30 p.m.
Today, Ash Wednesday--one of the latest Ash Wednesdays possible--we are reminded that religion plays a significant role throughout Minnesota history. It gave some the motivation to emigrate and settle here. It's an organizing dynamic for many communities and can justify the preservation of cultural identities and languages; even providing a rationale to remain isolated from others. Religion can even explain why our capital city is no longer named Pig's Eye. Religion impacts history work, too, from days off work to genealogical conundrums and more. Many historical organizations feature exhibits and publish books about various religions in their communities, and some, such as the Golden Valley Historical Society, use former religious sanctuaries as their facilities. Former sanctuaries present a unique set of challenges when reused by museums, and in this case, must recognize a unique set of community expectations. 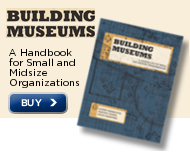 Still, as observed in "Building Museums: a handbook for small and midsize organizations," historical organizations need to be able to carry out programming in their facilities. GVHS has worked many years on plans to expand its facility to accommodate best practices and to meet the expectations of its community. Her Honor: Rosalie Wahl and the Minnesota Women's Movement, by Lori Sturdevant. March is Women's History Month! Available from Minnesota Historical Society Press.